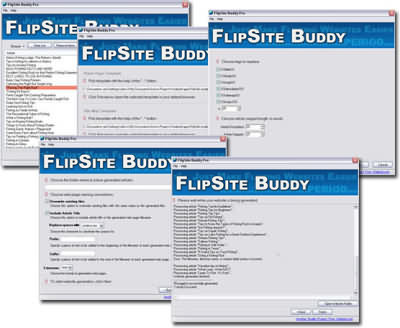 Flip Site Buddy has a very simple to use interface. This is an amazing tool! I used the Lite version and I must say that I am very impressed. Creating websites was a breeze and I was able to create tons of websites all Adsense targeted. Automatically takes the title of your article and puts it in the title of the webpage it creates for automatic Search Engine Optimization! Automatically link all of your pages together in a smooth, effective way. Free Adsense Website Builder, Turn Txt Documents Into Instant Adsense Websites. * Automatically Inserts Unique Web Page Title - Automatically takes the title of your article and puts it in the title of the webpage it creates for automatic Search Engine Optimization! * Easy To Customize - With a few easy changes you can add Adsense code, e-mail sign-up form, affiliate links, and anything else your heart desires! * Moves Like Lightning - Flip Site Buddy will pop out your fully functional, ready to upload content portal in seconds. Even if it's thousands of pages! * Strategically Links All The Pages Together - Automatically link all of your pages together in a smooth, effective way. This will get your whole site spidered and indexed super fast. A user-friendly program that makes it easy to memorize words, facts, dates, etc. Secretly record and monitor all computer activity when you aren't around! Qweas is providing links to Flip Site Buddy 1.0 as a courtesy, and makes no representations regarding Flip Site Buddy or any other applications or any information related thereto. Any questions, complaints or claims regarding this application Flip Site Buddy 1.0 must be directed to the appropriate software vendor. You may click the publisher link of Flip Site Buddy on the top of this page to get more details about the vendor.